In order to try to identify the seismogenic sources in the epicentral area, we interpreted data collected from gravity and aftershocks in the eastern part of the Mitidja basin after the occurrence of the 21 May 2003 Boumerdes earthquake (Mw = 6.8). The residual gravity anomaly and the horizontal gradient maps revealed the basement shape and density discontinuities. 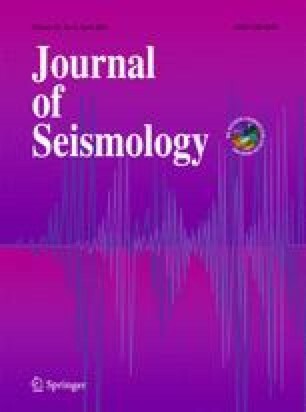 A seismotectonic model obtained from the aftershocks distribution and gravity data is proposed. This model highlights three active faults: one offshore and two onshore. The offshore reverse fault striking NE-SW, parallel to the coast, is consistent with the USGS focal mechanism of the main event, which is assumed to have the most moment release. The two onshore dipping blind active faults are postulated at crossing angles near the SW tip of the main fault. The interpretation is based mainly on the re-location and distribution of aftershocks, and their focal solutions. It is also supported by the basin structures obtained from the inversion and interpretation of residual gravity anomalies, as well as by additional compiled information such as the pattern of coastal co-seismic uplift. This configuration puts forward the failure mode complexity during the main shock. The topography of the basement obtained from 3D gravity inversion shows that all the onshore located aftershocks occurred in the basement, and the area between the two onshore faults rose as a consequence of their sliding.